Haunting on Devil’s Night is something of a tradition here at Horrorlust; regular readers of the blog know this to be true. It may not be the magical night itself when the veil between worlds is thinnest but Devil’s Night has a special aura all its own. The much ballyhooed Devil’s Night 2009 is the stuff of Horrorlust legend and was just this week enshrined as one of the five greatest nights in our haunted history. On that date we famously survived Hellblock 13 by the Wyandotte Jaycees, The Realm of Darkness (the final year of it’s original location) and finished the night with a maiden voyage to Haunted Farm of Terror! In 2013 the Wyandotte Jaycees helped us kick off another memorable Devil’s Night with Bloodbath on Biddle which would go on to win the Horrorlust Dark Horse Award that season. That evening would also mark our first exposure to a rookie by the name of Hush which absolutely wowed us and subsequently claimed the Horrorlust Haunt of the Year Award. The night did end with a historic dud in what would become known as the death knell for the Scream Machine, that shocking turn-of-events earned Scream Machine the Horrorlust Rotten Pumpkin Award and in the process made Devil’s Night 2013 all the more memorable. Last year we ventured first to Dark Legacy and were impressed with the scale and scope of the new attraction — it garnered the Horrorlust Killer Automatons Award. We then returned to Hush where we were once again blown away by a sterling performance that earned the then sophomore haunt the Horrorlust Monster Award. So yeah, Devil’s Night is serious business around these parts and it is with great excitement that we anticipate another evening on the road as mayhem and mischief rule the night! If all goes as planned we will visit four separate haunted houses beginning with Terror on the Boulevard, a home haunt located in Lincoln Park. I actually attempted to visit this haunt on Devil’s Night 2012 but the so-called Frankenstorm that was all the rage at the time thwarted my efforts. Next, we’ll burn rubber to Westland and tour Hush for a third consecutive year on Devil’s Night — this combination has yielded nothing but magic thus far so we saw no reason to make a change. Furthermore this will be the endgame for the original location as big plans are on the horizon — is this the year that Dr. Phun and the bunch render us a permanent fixture of the haunt?! If we manage to escape it’ll be off to Wixom for the revamped Dark Legacy and then a flight to the finish at the brand new Rotten Manor in Holly. Methinks this shall be another Devil’s Night to remember for years to come. In episode #008 of Horrorlust Radio, I’m joined by long-time friend and fellow haunted house enthusiast, Phil Patroniti. In this installment of Horrorlust Radio, Phil and I reflect on the highs and lows of the 2014 season. We also discuss our earliest memories of haunted attractions and explore the reasons why haunting remains near and dear to our hearts. This episode also features the second installment of Pop Horror, a segment concerned with horror in television and film; this time around we’re discussing season five of The Walking Dead. We also debut a new segment entitled Hallowed Grounds, in which we highlight one of the many awards recognized here at Horrorlust; today the spotlight will fall on the Horrorlust Haunt of the Year Award. 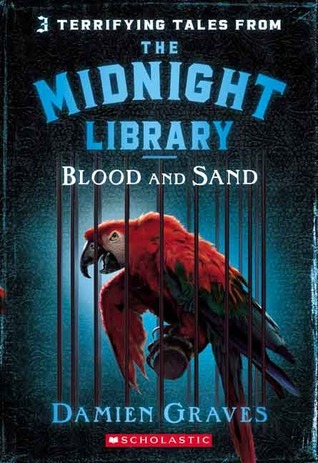 The short horror fiction series I mentioned near the beginning of the podcast is called The Midnight Library. The series seems to consist of only twelve books; the first was titled Voices and was released in 2005. The cover shown below is from the second entry in the series entitled, Blood and Sand. Any animal that can mimic human speech is surely evil. I also made reference to a Saturday Night Live sketch called “The Merryville Brothers.” In each bit a couple is seen entering what resembles a traditional carnival dark, the theme of the which varies from sketch to sketch. In each version the characters witness a performance by the animatronic Merryville Brothers who are portrayed by live actors. Inevitably, one of the characters become creeped out by the robots; a fear that is only heightened when the ride experiences a subsequent malfunction which in turn gives rise to a series of increasingly strange antics on the part of the Merryville Brothers. SNL regulars Taran Killam, Bill Hader and Bobby Moynihan appear in each entry of the series of sketches; guest stars include Jim Carrey, Justin Timberlake, Bruno Mars and a cameo by Tom Hanks. Click the link to watch the Merryville Brothers Halloween.